Does the crisp mountain air start to make you feel thirsty? 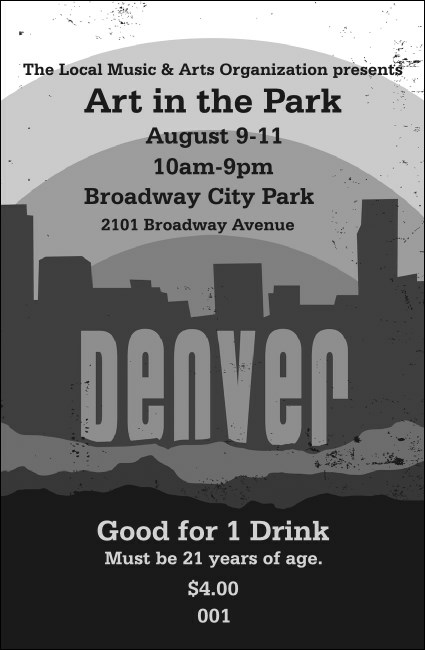 Indulge yourself and your organization with the Denver BW Drink Ticket. With a vertical orientation and space to upload your organization's own logo or custom image over an illustration of the Rocky Mountains and the Denver skyline, it matches the Denver publicity materials and helps you manage bar sales. Put your best face forward with customized image uploading and TicketPrinting.com.